Thanks to Hollywood, most people picture California as the stereotypical beach scene. But Northern California holds much more than sunny beaches, palm trees, and surfers; the Northern coast has the world’s tallest trees. Literally… the tallest on Earth. The coastal redwoods were first discovered for their high quality lumber, and, beginning in the mid-19th century, continuing almost to the end of the 20th, all but 5% of the old-growth coast redwoods in existence were chopped down. 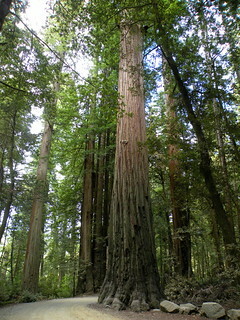 It is thanks to conservationists like Save the Redwoods League and others that those 5% remain standing. But what we’re left with is still pretty mind-blowing. Picture yourself standing in an old-growth forest, the smell of earth and plants overwhelming your senses. Redwood trees stretch nearly 400 feet above you. You can hear ocean-bound rivers, and not far inland, mountains rise steeply for thousands of feet. Life is all around you and you feel connected to nature in a way you haven’t before. This peace and serenity is what Northern California’s Redwood Coast has to offer. And, if you’re like me, you’ve always dreamed of exploring the parks and witnessing the grandeur of the redwoods. Well, now you can! The new book, Top Trails: Northern California’s Redwood Coast by Mike White, covers 57 diverse routes into and around the redwood forests. There is a trail perfect for you, no matter your ability level or interest. The book provides detailed route maps, as well as GPS waypoints for those of us who get lost easily. “This hiking guide will transport the reader to the prime spots within this scenic wonderland on 57 trips, ranging from coastal walks with ocean views to strolls through serene redwood cathedrals,” White says. On the trails, you can come across a variety of fauna. Perhaps the most identified is the slow-moving banana slug, which thrives in damp, forested environments. You could also stumble across Roosevelt elk, mule deer, and smaller mammals like coyotes, foxes, otters, badgers, and ringtails. If you prefer bird watching, the redwood coast has that, too! Cormorants, egrets, herons, pelicans, bald eagles, sparrows, woodpeckers, marbled murrelet, spotted owl, and many more birds can be spotted. You may even spot some harbor seals, sea lions, or migrating whales if you venture to the coastline. No matter your interests, the redwood coast has something for you. In Top Trails: Northern California’s Redwood Coast, veteran outdoors author Mike White presents 57 diverse routes, suited to all ability levels and interests. These trails range from a gentle half-mile morning loop to a 29-mile backpack adventure. Whether you’re looking for lush, old-growth redwoods or picture-postcard vistas to Pacific Ocean sea stacks, dazzling sunsets, and migrating whales, you’ll find it here. Each hike includes clear concise directions to the trailhead, a detailed route map and, for some trails, an elevation profile, “Don’t Get Lost” milestones, including GPS waypoints, and expert trail commentary. The award-winning Top Trails series includes innovative trail-feature charts, showing wildlife possibilities, scenic vistas, child- and dog-friendly trails, and more.